PROVERBS 3:5 KJV "Trust in the LORD with all thine heart; and lean not unto thine own understanding." 2For length of days, and long life, and peace, shall they add to thee. 3Let not mercy and truth forsake thee: bind them about thy neck; write them upon the table of thine heart: 4So shalt thou find favour and good understanding in the sight of God and man. 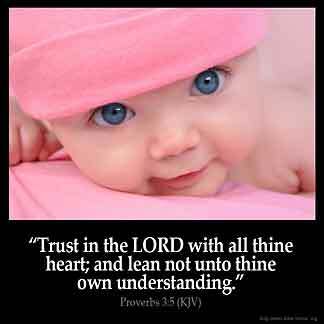 5Trust in the LORD with all thine heart; and lean not unto thine own understanding. 6In all thy ways acknowledge him, and he shall direct thy paths. 7Be not wise in thine own eyes: fear the LORD, and depart from evil. 8It shall be health to thy navel, and marrow to thy bones. � Trust in the Lord with all thine heart; and leaue not vnto thine owne vnderstanding. Trust in the LORD with all thy heart, and lean not upon thine own understanding. I'm dealing with something and I have faith that God will see me through and answer my prayers I love this verse it has helped me in so many ways!!!! I will Trust in the Lord with all my heart : This is a heart thing not a mind thing : The mind is enmity with God : so therefore whatever I may think is right in my own eyes is not right in God 's eyes. He has a better plan mapped out for me : So I go to His word and in prayer I will get myself lined up with Him and will be getting out of or in to what and where I am to be. I have to go up to be able to get out. The way of the natural world is down : down : Praise God for His Wonderful salvation. I've been going through a lot lately and I read this today my spirit uplifted I have faith in the Lord. I believe He can guide me all of us through the right path. I needed this thought this morning! We can get caught in our world of worry when all we can do it to be prepared to accept the change that 's coming our we and trust that it will be good. faith is the confidence that it 's already done! faith in God pleases him! makes God happy , by faith we declare the challenges overcomed, the failures end in passes, the impossibles made possible and it brings the inner joy and peace of mind. I passed in a difficult situation, by grace and mercies, prayer and the scriptures lifted my faith, i stand trusting God all that i declare in prayer in line with God s will all declaration will come to pass ....Mark 11:23, ......mountains obey a command of faith, a command with belief that what has been said shall come to pass.